I am a Bah Humbug when it comes to Hallowe'en and the practice of Trick or Treating that has crossed the Pacific in recent years; the Australian fascination with Trick or Treating only seems to have appeared this century. I feel that we have enough Australian traditions that we don't need to import any more, especially those that involve hastening the ruin of kids' teeth and adding extra grams to their chubby little bodies. But when it comes to the grandchildren...... there are just some things one has to do. Hallowe'en 2011 saw me donning my academic gown and a witches hat, buying a cache of sweets and waiting for the doorbell to ring. As our driveway is a hundred metres long children do not randomly call at our place so I knew who it would be when the doorbell rang. I answered in my best witch's voice and frightened my poor two year old grand-daughter; her five year old brother thought it quite funny. As can be seen from the photo above the poor little one was still not sure of herself when we posed for a photo after I distributed the lollies. I won't be available for the event this year as I will be in Valencia,Spain. I wonder if they celebrate Hallowe'en there? While I am journeying around the globe I have been blogging at ballau.blogspot.com. I am hoping to have a couple of research days in London next week and will post reports of my activities here after those visits. A Trove search for my Alma Mater, St Vincent's College, Potts Point, returned more than newspaper articles. I found books, journal articles, photos and a website. All I can say for this Trove Tuesday post is that my great-grandfather had a big family to feed and clothe. One hundred and twenty one years ago my great-grandfather, James Pusell, had a date in Court. I have just completed a 10 day bus tour of Poland in the company of Mr Geniaus and 33 other people. We went on this trip because of a desire to visit a new country and to learn about its history and culture but most of our fellow travellers were there for another reason. At least 24 members of the group had Polish ancestry; they were not into genealogy at all but just felt a need to travel to the land of their ancestors. A couple of the group had done some prior research through their local libraries and one had engaged a professional genealogist to help trace his roots. Some of the group already knew of cousins in Poland and had arranged to extend their visit to meet up with them while others came on the trip just armed with the name of a town and a hope that that could visit and find some connection with their heritage. Sadly those that did not do much preparation were likely to be disappointed. One of the town names that was being sought was common to three towns in different regions of Poland and our poor guide was at a loss to give assistance in this case. 1. There is a market for Find your Roots tours to Poland. 2. Any genealogist with Polish roots would do well to join an organised tour like the one I did as they would be likely to pick up a bit of work from the US tourists in the group (our group had 29 North Americans). I did give Lisa Alzo's details to one couple from New York who want their genealogy explored..
3. Only two members of the group could communicate in Polish but many knew about and cooked Polish dishes. 4. Although they don't do genealogy many people are interested in the people, places and stories connected with the lands of their forefathers. 5. One must do homework before heading off to foreign lands in search of ancestors. Lately I have been distracted by my globetrotting and haven't given Rootstech much of a thought except when I have been telling my fellow tourers from the US what a great event it is. I was pleased to get a reminder email from Amy one of the Rootstech organisers who noted that I hadn't yet completed my registration for the event. Luckily I am at a hotel in Barcelona that has a free wifi connection so I am about to complete that task. There is no way I would miss it. I just went over to the Rootstech site and was pleased to see that it is sporting a new look (I didn't like the previous iteration of the site) that is a great improvement. Mission accomplished. I am all registered and so is Mr Geniaus! Mr Geniaus is not into genealogy but supports me in my endeavours; last year I registered him for the full conference and he had a great time socialising with my fellow bloggers and other people he met along the way but the talks weren't really his thing. It was also handy to have him along as a sort of Personal Assistant to take photos for me, to run errands and fetch me lunch. He had previously indicated that I should not register him for the conference but when I told him about the Getting Started Track that would give him access to the exhibition hall and some beginner's lectures for only $39 he jumped at the chance to register. It seems he really like my blogger mates who "were so nice to him" that he wants the opportunity to hang around the conference and chat with them. You may have read that some conference hotels are full and that additional official hotels have been added. When I logged in to register I noticed that most of the hands-on computer workshops are already sold out and as are most of the speciality lunches. So if you need a bed, want to hear some great lunchtime speakers while being well fed and a hands-on class I suggest that you register for Rootstech right now. We’re delighted to announce the launch of Seeking Founding Mothers, an Australia-wide project to identify women involved in shaping the federation and the Australian Constitution in 1901. These women, whose work helped turn colonies into states and create our nation, will be the stars of Women’s History Month Australia in March 2013. The project will also contribute to other commemorations throughout the year including Constitution Day on 9 July and the Canberra Centenary. Let us know about your own Seeking Founding Mothers Women’s History Month discoveries and events and check out www.womenshistory.net.au to share in the federation of ideas and happenings in 2013! info@womenshistory.com.auWe’re delighted to announce the launch of Seeking Founding Mothers, an Australia-wide project to identify women involved in shaping the federation and the Australian Constitution in 1901. Let us know about your own Seeking Founding Mothers Women’s History Month discoveries and events and check outwww.womenshistory.net.au to share in the federation of ideas and happenings in 2013! Something different for this week. If you set up a user profile it may help others who view newspaper articles you have tagged find you. User profiles - another way to create Cousin Bait. Travelling around Poland we have heard lots about Polish born Pope John Paul II and his life as a religious man. Yesterday we saw some photos of he and his family on this billboard in Gdansk. If I was in Australia I'd be pointing the Bambino towards Matiland in the Hunter Valley this weekend to attend their Family History Fair. Minimal details can be found on their website. This post is a tad late because I am on VACATION. My mantra for this post is "All work and no play makes Jill a dull girl". As much as I love genealogy and technology there are times when I must step away and smell the roses. So, for the next few weeks posts from me will be few and far between as I am presently on holiday overseas creating current family history with my mate, Mr Geniaus. I will be posting about our adventures from time to time on ballau.blogspot.com. You may be interested in Penrith in Pictures, an online searchable database of photographs from the area. I notice, on the Hills District Historical Society Site that they are having an Open Weekend on October 6th and 7th. The theme is "Threads: An exhibition of wedding gowns and vintage clothing. Full details can be found on the Society website. The world of technology is awash with acronyms. 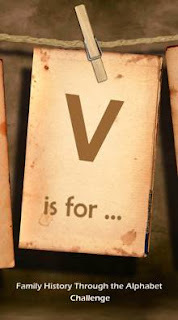 I am often challenged when giving a talk and someone asks "What does that *** stand for? Sometimes I know the answer; soometimes I don't. It seems as though a few of these acronyms start with B so, for my U post, I thought I'd share a few U acromyms with you. Short for uninterruptible power supply, a power supply that includes a battery to maintain power in the event of a power outage. Typically, a UPS keeps acomputer running for several minutes after a power outage, enabling you tosave data that is in RAM and shut down the computer gracefully. "In computing, a uniform resource locator (URL) is a specific character string that constitutes a reference to an Internet resource. A URL is technically a type of uniform resource identifier (URI) but in many technical documents and verbal discussions URL is often used as a synonym for URI." 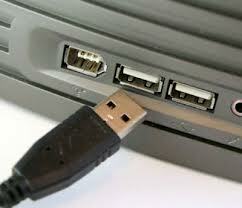 "Universal Serial Bus (USB) is an industry standard developed in the mid-1990s that defines the cables, connectors and communications protocols used in a bus for connection, communication and power supply between computers and electronic devices." 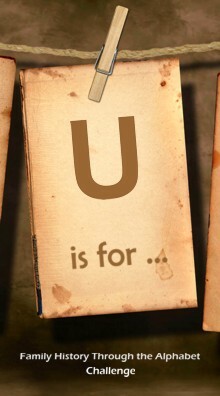 Do U have any favourite U acronyms? 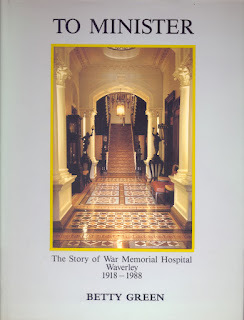 I reported in my Trove Tuesday post last week that I found details of a book, To minister : the story of War Memorial Hospital, Waverley, 1918-1988, about my birthplace, War Memorial Hospital, Waverley on Trove. I located a few copies of the book on Abe Books and ordered one from Jo's Books, Gerringong. The book, that was in excellent condition, arrived within a few days and I am thrilled with it. Written by a former Matron of the hospital, Betty Green, it tells the story of the hospital from the planning stages through to 1988. 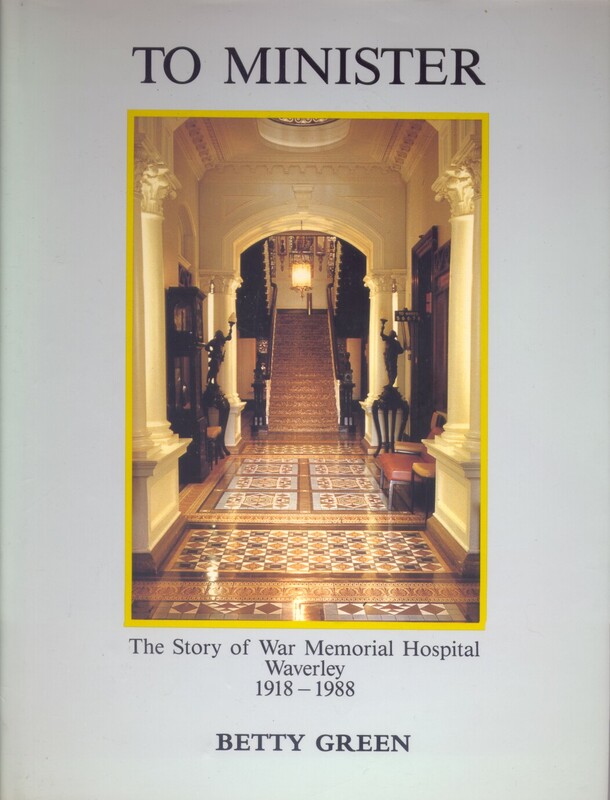 The book is illustrated with floorplans, maps, copies of documents and photos and gives an excellent overview of the Hospital's activities and history. The stories about the people associated with the hospital add warmth to the cold facts presented through the work. Gingerly I showed my purchase to Mr Geniaus (he doesn't share my love of book buying) who spent quite a while thumbing through the book. He saw photos of quite a few local identities that reminded him of stories associated with them (he would be a good subject for oral history interviews about Waverley personalities). Mr Geniaus was quite impressed with the book which he has picked up a few more times during the week. What makes the book an excellent genealogical resource are the lists of names it contains that include Members of the Council/Board of the hospital, Matrons, Student Nurses, Pupil Nurse Aids and Doctors associated with the hospital. I have yet to read the book from cover to cover but I know that I will enjoy it. Thanks to Trove, a resource that leads one to more than newspaper articles, for directing me to this book. Wondering what your ancestors wore? Have a few minutes to spare? "The Australian Dress Register is a collaborative, online project about dress in New South Wales pre 1945. This includes men's, women's and children's clothing ranging from the special occasion to the everyday. Museums and private collectors are encouraged to research their garments and share the stories and photographs while the information is still available and within living memory. The Register encourages people to consider their collections very broadly and share what they know about members of their community, what they wore and life in the past. This provides access to a world wide audience while keeping their garments in their relevant location." 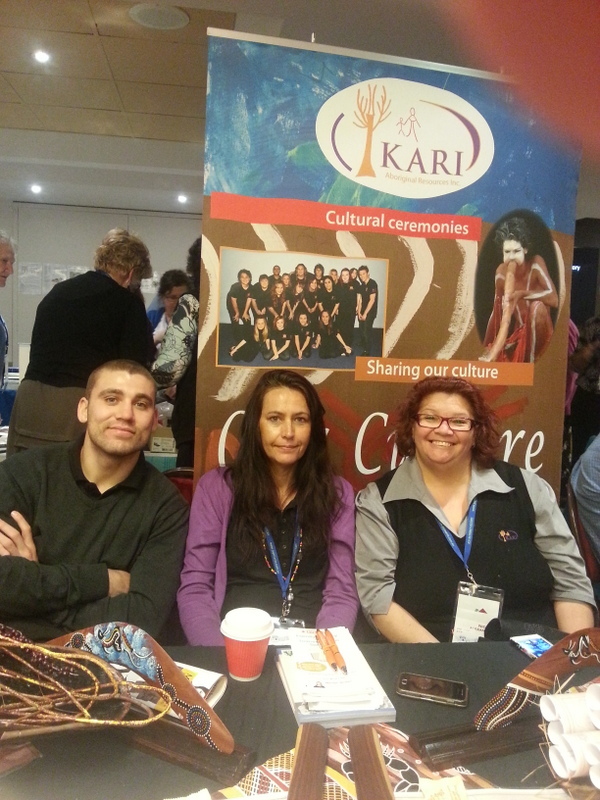 One of the stands at the recent NSW&ACT State Conference that really interested me was hosted by The Kari Group. I am quite sure that I have an aboriginal ancestor, Biddy Sergeant, whom I think was the mother of my ancestor, Bridget Ann Hayward. I just can't find any evidence to support my supposition. Unfortunately I didn't get to visit the stall until the very end of the conference so I didn't have time to converse in depth with the friendly people there. In the short time I had they were most helpful and gave me a wad of handouts from AIATSIS that I am just getting around to examining. I was just having a wander around the AIATSIS website and found that they have a Family History Unit and that the wad of papers I was given as handouts are available on their site as downloadable .pdf files from the Family History Kit. One can also search for a family name in the Aboriginal Biographical Index.